Charles Darwin's insights during his travels on the HMS Beagle in the 1830s revolutionized the natural sciences. And his personal accounts of the journey, such as his encounters with Magellanic Penguins, tell captivating stories. As an experiment, Darwin stood between a penguin and the sea. The undaunted bird waddled directly into the young naturalist! 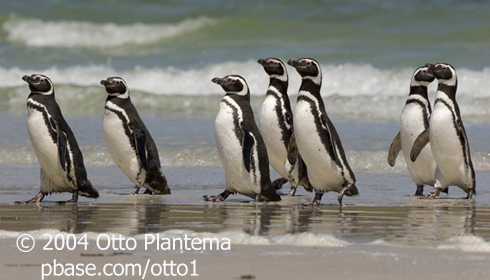 Learn more about the Penguin Project and efforts to save penguins. Charles Darwin’s insights during his travels on the HMS Beagle in the 1830s revolutionized the natural sciences. And his personal accounts of the journey, such as his encounters with penguins, tell captivating stories. Braying of the Magellanic Penguins provided by The Macaulay Library at the Cornell Lab of Ornithology, Ithaca, New York. Recorded by C. Christopher. Ambient wave by Kessler Productions. Quotes from a letter to J.S. Henslow, from The Complete Works of Charles Darwin Online; from Moorehead, Alan. Darwin and the Beagle. New York: Harper & Row, 1969; and from Darwin, Charles. The Voyage of the Beagle. Ed. by Leonard Engel. New York: Anchor/Doubleday, 1962.